As digital marketers we can all likely agree that with a multitude daily metrics to assess, the ability to use software tools to help us in our daily work lives is essential. With that, this Tool Tuesday we are taking a look at CognitiveSEO. CognitiveSEO, the brainchild of Razvan Gavrilas, has been live since 2011 and to this day is used by thousands of today’s top brands and agencies. Off the cuff, the tool gathers data across link data, organic visibility and social media presence and is presented in a dashboard tab view, much the same as other tool solutions provide. So, what makes this tool different? Let’s take a look at each one of these sections and highlight why we think this tool is a must-have in your digital marketing toolbox! In order to analyze data we can utilize the Instant Backlink Explorer or we can create an on-going campaign. To get the fullest benefit out of this solution we advise employing the latter option. Creating a new campaign is rather easy through a five step on-boarding of domain information. In a matter of minutes we provide the tool with our domain name, competitor domains, link analysis commands, keywords to rank and finally a name for a campaign. A feature that we like here is the ability to solely set up campaigns based on subdomain focus. We can do this for all tool features of this campaign but also to add or remove subdomains from link analysis. This is a handy feature as many tools can be deemed great but they often bucket data at a domain level, leaving you with quite a lot of time parsing data at the subdomain level if needed. We have a new campaign setup and within minutes our data is being presented for our eager review. The first area in the navigation bar aside from overall dashboard view is the Inbound Link Analysis. This we feel is the bread and butter of the tool…and it is good butter! This link analysis view is easily formatted to your desire based on time range and also by competitor view. Additionally, there are several filter options for your choosing such as linking site TLD, website type, etc. This is a feature familiar with the use of a tool such as LinkDex but we enjoyed the ability to easily filter to specific data for our review. Remember, no two digital marketing projects are the same and your review of data will always differ between projects. So what’s the coolest feature in this tab view? Well, there are actually a couple. One that stood out to us is the Unnatural Link Detection section. This is a very helpful analysis of your link profile to better understand the percentage of site links that are considered to be unnatural or in the least suspect. A very clean presentation leads to the additional ability to dig into specific links. Even better, we have the ability for a Google Disavow file export. This is similar to the research you can glean from a tool such as Link Detox but we felt it was better presented in this display. Another feature we enjoyed is the Link History section. For those of you who use MajesticSEO you may be familiar with this feature to review a timeline by day showing new links as well as lost links. Where CognitiveSEO takes this a step further is to feature new/lost links by timeline but also sorting functions of unnatural links, type of link, type of linking site, and link velocity…all within the same timeline feature. 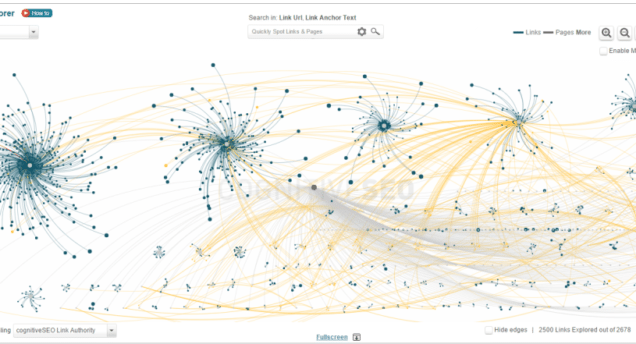 This makes link analysis very quick and educational. Another really cool feature is the Visual Link Explorer. Do we have to have this to be effective analysts? No, but it does a great job of visibly helping you understand what pages on your site hold the most inbound links and what the best links are that link to these pages. While at first this view may look quite confusing, the ability to filter and zoom in within this section will make your analysis a little more understandable. While there are many more sections within this tool area, the above were what we felt stood out as factors to make your analysis faster and more informing. Other areas of link analysis are similar to those you would find in OpenSiteExplorer such as anchor text review and side-by-side competitor metric grading. This area of the tool dives into the composition of your(and your competitors) Social Media presence. There isn’t a massive array of data in this view but what is presented are the essentials and more importantly, a clean, understandable presentation. This section begins with an overall view of total shares of content in Social Media. A cool feature for removal of data inaccuracy is their Anti-Noise Technology which understands parameter usage and URL variations via ex. URL UTM tracking parameters so that page level share data is not polluted or inaccurately separated. A neat offering within this view is the Social Distribution graph. This allows you to quickly assess the percentage share breakout by social network of your site’s content as well as competitors. Taking this a step further, further research is available at a page level as well as timelining graph capability to show over time, the pages with an increase in social sharing. In all these capabilities, it is also possible to segment by specific social network. If we could take this section a step further, we would like to see more similar social data comparable to a tool such as BuzzSumo or Twtrland so that we can look at high level metrics but also dig into what influencers are promoting our content. The two previously mentioned sections of the to review inbound links and social activity are definitely the shiniest part of this chassis, but there still continues to be offerings worthy of review. The Rank Tracking section features the same type of data you would find from a solution such as SEMrush, Moz, etc., with insight on ranking movements of your site and competitors from desired time ranges. What makes this view attractive though is that from an Overview snapshot one can quickly find an average ranking of one’s own domain as well as competitors accompanied also by a well laid out presentation of rankings by page in Google, Yahoo or Bing. Additionally, one quick click brings us a competitive comparison of rank wins and losses vs. you and your competition. Like I said, the reporting capability in this section isn’t new, it is the way it is laid out. Further in our review, past the initial bells and whistles of the tool we get to the management offerings of the platform. The Link Management section is a link builders workshop. This is a place to easily organize link building efforts of outreach and note the progress of these initiatives. What we liked most about this tool was what set it apart from other link management solutions. We found daily monitoring of links which was very beneficial. Additionally, instead of uploading link outreach tasks one at a time, there was a bulk upload feature. Furthermore, link monitoring provided great detail to monitor inbound links by placement on the pages as well as follow/nofollow to provide a few features. In this, you have the daily ability to monitor your most important links for changes. Similar to this section is that of the To-Do section. As we mentioned that the Link Management section does a great job of providing a one-stop shop for managing a linkbuilding effort. The To Do section allows for a team to surround a digital marketing effort for domains by assigning tasks based on insight gleaned, not only in link building but pertaining to any section of the tool. Task designation is not a new concept in marketing tool software but helps to round out the offering in a very competitive space of marketing tool companies. So, there are no free lunches in life, right? Well, yeah, but CognitiveSEO does offer a 14 free trial to let you take the platform for a spin. For many, those that manage/monitor 25 domains(including competitors) or less, the above mentioned data insights are available for only $99 a month. 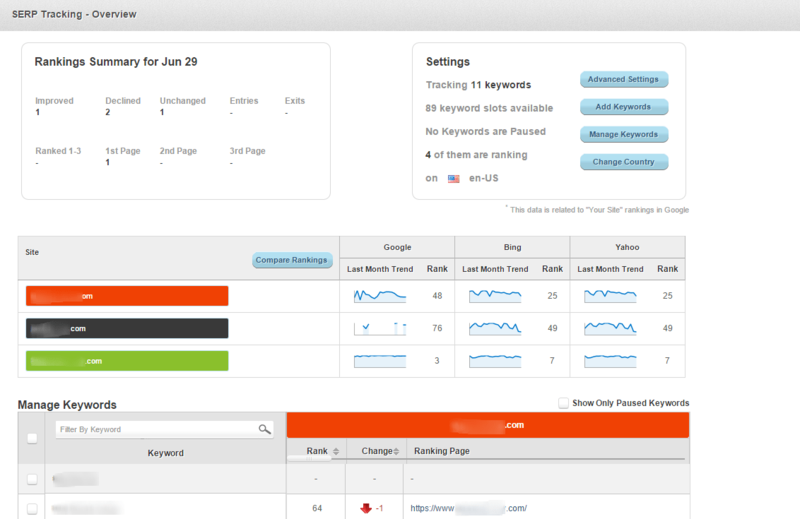 This allows for multiple users, and the analysis of 200K backlinks and the monitoring of 1,5K keyword. The tiered pricing structure expands to include Premium and Elite packages ultimately costing $499 a month and with a coverage of 100 domains, three million links and over 13K keywords tracked. If that doesn’t satisfy you data hunger, starting at $1,000 you can build your own plan. This is truly a great tool. While there are many cool features that are unique offerings, those which we expanding on above, there are also features found on other tool platforms provided elsewhere today. What makes this such a great tool is that CognitiveSEO has definitely made a conscious effort to present essential site metrics data in an easily understanding way. Good job, CognitiveSEO!